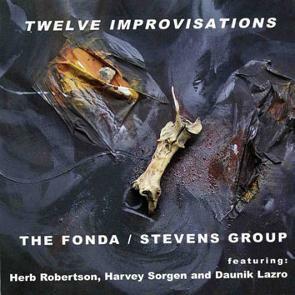 "Twelve Improvisations" is the fourth release by the Fonda/Stevens Group in the Leo Records catalogue. However this time the quartet, which includes regular members Herb Robertson on trumpet and Harvey Sorgen on drums, has been augmented by the French saxophone player Daunik Lazro on alto and baritone saxophones. The Fonda/Stevens Group is the "jazziest" outfit in the entire Leo Records catalogue, but their jazz is different from the contemporary "retro" styles that give jazz a bad name. Each of 12 pieces starts as an improvisation, but finishes as a thought out composition.